Does your child love to dance, twirl and play dress-up? Then they will LOVE becoming a Princess Ballerina! To inspire & delight your budding ballerina each week with a different theme each session! Thematic music & imagination brings the theme to life for your child! Matching props, coloring page, sticker chart & dress-up costumes are sure to inspire your child! - Session based, thematic pre-ballet and tap dance class created just for little ballerinas ages 3-5! 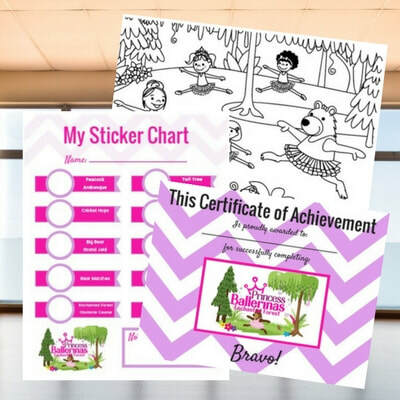 - Exciting student bonuses like a coloring page, sticker chart and award certificate! - Your in-class Parent Performance will be on the last day of each session. Costumes will be supplied on a "Dress up" basis! ​ to celebrate our dancer's achievements! - There is a Recital Option with everything necessary included - from a costume with tights to pictures and video, even a Special Recital Rose! - Our simple pricing makes paying for dance easy! Choose between monthly payments and all-inclusive options, find the best fit for you! - Each class starts with a warm up, stretching and a review of our arm and foot positions during our Circle Warm Up. We'll take time to answer our Question of the Day too! - We practice our Princess Ballerina steps (and review their fancy french names!) like releve, plie and jetes! We also learn our Terrific Tap steps like shuffle, dig and flap! - We travel to an imaginary land and pretend to be things like fairies, flowers, butterflies, rain, or jack-in-the-boxes! Each session has its own special, magical theme with coordinating imagery, like A Fairy Garden Adventure or Winter Wonderland! - We practice our Princess Ballerina Routine that we can't wait to show you during our Parent Performance during class in our fancy dress-up costumes! - Each class ends with a special sticker to reward our daily achievements! We love filling in our sticker chart!